Please let them know so that the Scale of Points for the Lizard canary reflects the wishes of the breeders not just in the UK, but throughout Europe. This is your chance to be heard. For information about the new Scale of Points, and the way in which it was approved, I suggest you read Part 1 and Part 2 of my report. The minutes of the meeting have been referenced here and elsewhere. As ‘Best evidence’ of the deliberations and confirmation of those present, is there a link available to them ? Presumably they are not confidential although allowance may have to be made if still in draft form prior to January, particularly in the light of the different views of who voted ( or abstained) and how. . When I heard the news about the change to the points of the Lizard standard, I couldn’t believe what I heard. A lot of Lizard breeders I know were disappointed about it. There is no lizard breeder I know who was happy to hear it. Over all the years the lizard became such a high quality, that you couldn’t reach without the standard we have at this moment. The Lizard is much more than spangles, rowings and black legs & feet. Every single detail contributes to the whole of the high quality Lizard you see at this moment. The people who made the standard so many years ago were specialists and they knew what they could achieve with the Lizard in the future. Without the knowledge of those founding fathers, the Lizard would not have achieved the quality we see today. Changing the standard is the same as going backwards. The most important thing is that we must think about the future of the Lizard and not listen to what a few people want. I think, as with every bird, it is very important to ask the opinion of the specialists of that variety, before just changing the standard. Nobody asked the Lizard breeders in Belgium. Footnote by Huw Evans: Bart is a current World Champion Lizard canary breeder. It is very remarkable that there are a few people who want to change the standard of the Lizard canary. Real specialists (top breeders) have been working for many years to achieve the standard set for the Lizard canary; it cannot just disappear. The assessment of this bird is more than the sum of its parts. The standard of the Lizard requires that various components of the bird must all fit together. As well as the spangles, the rowings and black legs must form a complete composition. A change would be a loss. I hope you can do something, so that all this doesn’t change. Het is zeer opmerkelijk dat er een paar mensen zijn die de standaard van de lizard kanaries zomaar willen veranderen . Waar echte specialisten ( top kwekers ) jaren bezig zijn om dit te bereiken bij de lizard kanarie kan niet zomaar verdwijnen . De beoordeling van deze vogel is niet zomaar een optel som . De standaard van de lizard , zijn diverse onderdelen van de vogel wat allemaal in elkaar moet passen . Zowel de spangles, rowings als zwarte poten moeten een combinatie zijn van het geheel . Een verandering zou een verlies zijn . Ik hoop u hier wat mee kunt , om dit alles niet aan te passen . Après contact téléphonique et lecture des avis des éleveurs belges dont je fais partie, je peux affirmer que, tous, nous réfutons la nouvelle échelle de points du canari Lizard. Il n’y a eu aucune concertation quant à notre opinion et c’est dommage. J’ai aussi appris qu’aucun accord avec la LCA n’avait été conclu. Quel mépris vis-à-vis d’eux. Qui plus est, la façon dont le veto du délégué britannique a été contourné. Laissons nos amis Anglais avoir le droit de gérer leurs propriétés, ils n’ont plus rien à démontrer. 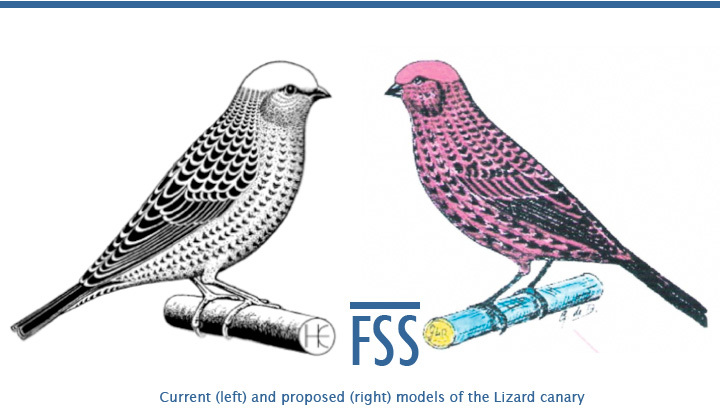 After contacting by phone and reading opinions of the Belgian breeders, of which I am a part, I can affirm that we Belgian breeders refute the new Scale of Points of the Lizard canary. We were not consulted and it is a pity. I also learned that no agreement with the LCA had been made. What a contempt for them and the way in which the veto of the British delegate was circumvented. Let our English friends have the right to manage their properties, they no longer have to prove anything. Footnote by Huw Evans: Fernand is a multi-World Champion with the Lizard canary. Le standard actuel mis en place depuis de nombreuses années par nos amis anglais, est trés bien équilibré . quel manque de respect de vouloir modifier l’échelle des points …….? les éleveurs de lizards de toute l’europe n’ont pas attendu des changements de notations pour le dessin de dos et de rowings, pour travailler le lizard. d’année en année , nous progressons dans la qualité des lizards mals et femelles. quand je vois 5 points pour plumes de couverture, queue et cils. je ne suis pas du tout d’accord ,je ne crois pas que se soit des éleveurs de lizards qui ont imaginé ce nouveau critére. cette nouvelle échelle de points est un déséquilibre complet du standard . je suis totalement solidaire du collectif qui se regroupe. The current standard put in place for many years by our English friends, is very well balanced. What a lack of respect to want to change the scale of points …….? The Lizard breeders of all Europe did not wait for changes of notations for spangles and rowings, to work with the Lizard. From year to year, we progress in the quality of male and female Lizards. When I see 5 points for covert feathers, tail and eyelashes, I do not agree at all. I do not believe that the breeders of Lizards who see this new creation of Portuguese standard agree. The new scale of points is a complete imbalance of the standard. There are always people who want to change things that work well, of course without any consultation of the main actors and interested parties (THE BREEDERS OF LIZARDS). I am totally in solidarity with the collective group. Footnote by Huw Evans: Vincent is a multiple World Champion with the Lizard canary. à modifié les critères de jugement. passe au stade supérieur et de se prendre tout à coup pour le Dieu du lizard. I am really angry because, after years of owning and breeding the Lizard canary according to the immutable standard, I learn that the technical committee of the OMJ has ignored its own procedures and has modified the criteria of judgment. How can we possibly explain that only about twenty people, who for the most part are not involved in the Lizard world, could, without any preliminary consultation of the LCA and amateur breeders, endorse the proposal to change the Scale of Points scale advocated by a chap so full of himself that his colleagues had already nicknamed him “the Professor” before progressing to the elite level, suddenly becomes the God of the Lizard. In solidarity with my fellow Lizard breeders, I call for the outright annulment, pure and simple, of this undemocratic decision. Footnote by Huw Evans: Jules will be well-known to most readers of the blog. He is a multi-World Champion, and probably the most successful breeder of Lizard canaries in recent years.